Looking down to Garapan and Managaha Island from Mt. Tapochao. Mt. 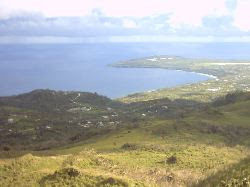 Tapochao (pronounced Top-a-chow) is the highest point on Saipan at 1525 feet. By standing on the peak you can take a visual tour of the entire island. Each time I visit Tapochao I can't help but think what it would have been like to watch the Battle of Saipan unfold from that vantage point. Mt. Tagpochau (another spelling) played an uneventful role during the battle. Several Marines scaled the cliff on the front side of the mountain on a recon mission to find out how well fortified the top was. It turned out that the Japanese defenders moved down the back side of the mountain to join in on the battle at Death Valley. Thus, Mt. Tapochao was captured. Looking up from the East. Looking up from the South. Mt. Tapochao from the plane. This hand grenade was found on Purple Heart Ridge just below Mt. Tapochao. WWII trash cans left behind with "USN" on the bottom. In the last few days of WWII an American B-29 made a landing approach at Isley Field. The bomber could not land on the initial approach due to bad weather and was forced to circle around for another attempt. It crashed on the west side of Mt. Tapochao killing the entire crew. This is one of it's four engines. The twisted props of another engine. This WWII truck is hanging over the side of a high cliff on Mt. Tapochao. Why is it here? Perhaps at the end of WWII they tried to push it off the side but it got stuck. My exploring buddy Stewie stands watch over some WWII artifacts we found in a cave on Mt. Tapachao in Saipan. 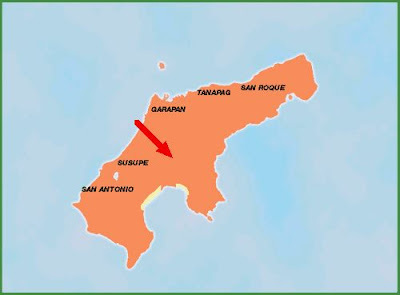 Caves in this area of Saipan were not only occupied by Japanese soldiers but Japanese civilians and locals as well. When the shelling of the town of Garapan started everyone ran to the hills with what they could carry. This looks like their best dishes. They lived in these caves for three weeks until the intense battle ended. WWII B-29 crash site video. Super awsome Saipan blog bro! I stayed there for three months when i was 15, back in '94. Bieng a kid there was killer,since I was into the outdoors my whole life. There are MANY great things to see and do there. And nearby islands, etc.. We also went to Guam and Bali. For making this blog though I really wish the pictures were alot larger,It brought back so many memories. Thanks, I'm glad you liked it. I agree Guam and Bali are very nice as well. Eric, excellent job on videotaping your visit to the B-29 crash site. It was perplexing to see so much cloth like material after all these years. It is sad knowing the young crew perished after such a long flight to Japan and back and shortly before war's end. I believe the B-29's started using that cloth as a way to reduce weight and metal on certain parts of the plane. I too was curious about the truck trailer on the side of the road and was told that it was used as a platform for loud speakers that was used to broadcast out to the defenders to surrender. I remember seeing a WWII picture of the trailer with the speakers on it...somewhere. Oh my gosh, are you sure it was a B-29? The Superfortress' propellers were 4 bladed, looking at your pictures the blades look like it had only 3 blades. A B-24 had 3 blades! Hi Leo. The 4th blade was bent under the engine when the B-29 crashed.